This was the statement of labor center Kilusang Mayo Uno in responding to the US ambassador to the Philippines Harry Thomas’ statement yesterday supporting the country amidst tensions with China over the Spratlys and reiterating that the US and Philippines are treaty partners. “Why is the Philippine government issuing war-mongering statements and why is the US showing too much eagerness to support the country in case a war erupts when in fact diplomatic means of resolving the issue have not been exhausted? The US is taking advantage of the strong-worded statements issued by the Philippine government against China to condition the people’s minds to favor the creation of US bases in the country,” said Roger Soluta, KMU secretary-general. “The Philippine and US governments are orchestrating a campaign of deception to make the public embrace US military troops as heroes in a possible war with China,” he said. 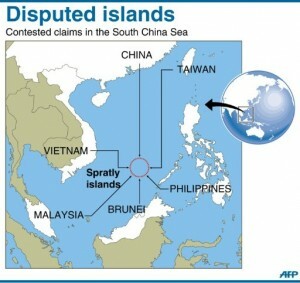 KMU said strategic geopolitical considerations are behind the US’ push for the Philippines to wage war against China. “The US wants to expand its military presence in the Southeast Asian region to counter the growing military strengh of China – which it considers a big threat. The expansion of US military presence in the Philippines is key to achieving these geopolitical goals,” Soluta said. “History has shown that the US does not hold back from fomenting war so it can advance its geopolitical interests. Under the US’ game plan, provocation for war plus the 1951 US-RP Mutual Defense Treaty, which mandates mutual support in case of attacks against each country, will pave the way for the return and expansion of US bases in the country,” he added.